Whether you want to plan for a comfortable retirement, protect and grow your portfolio, or provide financial well-being for you and your family, we can help you toward reaching the goals important to you. We bring a comprehensive perspective to wealth management. You bring your goals. Together we plan to achieve them. Together we prepare your financial plan. • Clarity to help you identify your financial opportunities, challenges, and goals. • Insight to help you accomplish your goals by making smart decisions with your money. • Partnership for long term success. As your life, financial and investment advisor, we work together to support you with innovative solutions as new challenges arise. Our advice process and high level of service are specifically designed for individuals and families who have over $500,000 to invest. With our focus on financial life planning, we only work with clients interested in a long-term relationship. That is why we meet together at least twice, before we make a mutual commitment. We want to make sure that we can make a real difference for you. 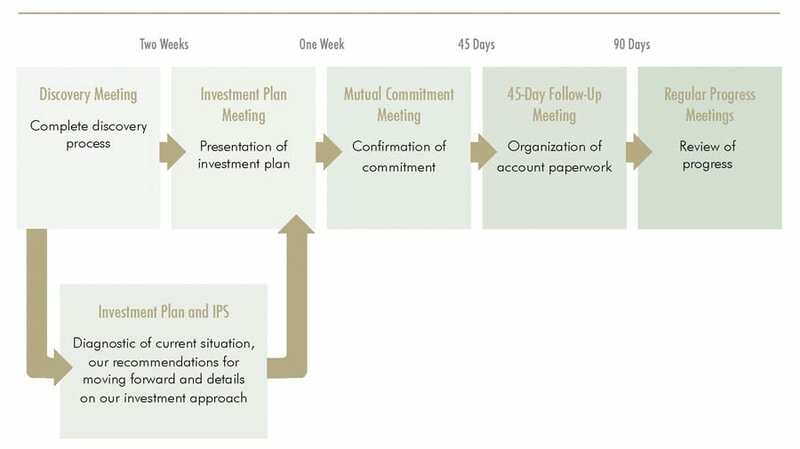 Our 5-step process is designed to help us create a dynamic financial plan that reflects and guides all you want to achieve. Simply put: what is most important to you, is our highest priority. We begin with a consultation to understand where you are now financially, and what you need and want for the future. What are your goals, concerns, dreams? Do you think you might be comfortable working with Regent Financial Services your financial advisor? If we decide to move to the next phase, we will gather financial information so that we can present a preliminary analysis at our next meeting. At our second meeting, we educate you on the investment strategy that we recommend, as your investment advisor, and discuss with you the results of our analysis – how does your current strategy compare to what we recommend. We think that an open, honest dialogue about your financial needs, beliefs, expectations, and concerns is critical to any successful financial advisory relationship, and should precede a mutual commitment. If you decide to move to the next phase, we schedule a third meeting. At our third meeting, the focus is on your thoughts and questions. If you decide to work with us, we begin the process of implementation. We also fine tune your investment plan, which you will take home with you. Please note—all the meetings to this point are complimentary and without any obligation to you. We explain how to read the investment statements that you will receive, and we review your Investment Policy Statement, which you will take home with you. The Investment Policy Statement reflects the plan we have agreed to and assigns responsibility and accountability. A comprehensive financial plan is instrumental in reaching our goal of funding your financial needs for your life, as well as preserving your wealth for generations to come. If necessary, we will gather additional information so that we can make your financial plan more complete. Your plan is never static. That’s why we’ll make our Discovery Process part of our ongoing meetings, so that your plan always reflects your life. Download Dedicated to Your Lifelong Success to learn more about how we work with our clients. We will meet twice each year to review the investments and update the plan. Additional meetings are scheduled to address any new planning concerns. 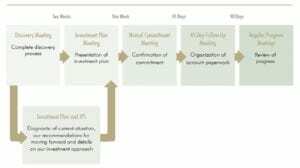 In addition, as financial markets rise and fall, your portfolio’s exposure to stocks, bonds, cash and other investments will tend to fluctuate as well. Through periodic re-balancing we will make sure your portfolio maintains its target allocations. This helps control the level of risk in your portfolio and minimizes emotional decision making. We will also work with your other advisors to address all of the non-investment action items we’ve identified. If work is needed on your estate plan and tax plan, we work with your attorney or CPA.